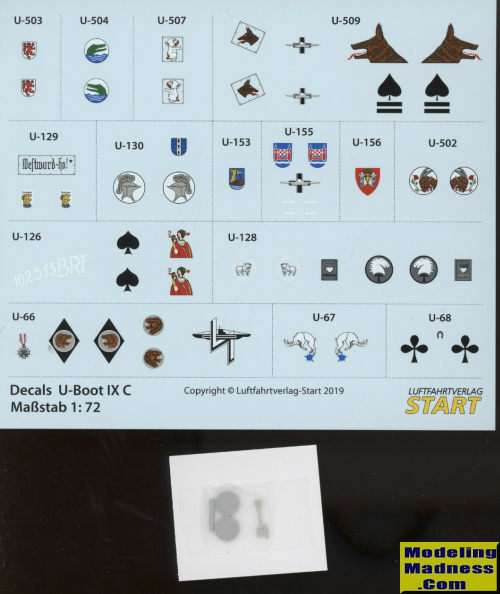 To go along with their various editions of U-boot im Focus, Start has produced a decal sheet for the Type IX U-boat. This sheet provides conning tower markings for a variety of boats. These sorts of things were pretty common place with some designs being quite well done. The sheet provides markings for 16 boats (ten of them shown here) and in at least one case, markings for the deck gun as well. Each marking is accompanied by a small photo taken from the magazines to assist you in placement. Also provided are small resin or 3D printed items. One of the U-66 markings options has the markings as a raised design like a plaque over which one would put the decal. Another boat, U-153 had a battle ax on the lower tower and that is also provided. While the instructions are mostly in German, that should not be an issue for the majority of modelers. The decals themselves are superbly printed. The only kit of which I am aware is by Revell and it is not inexpensive.